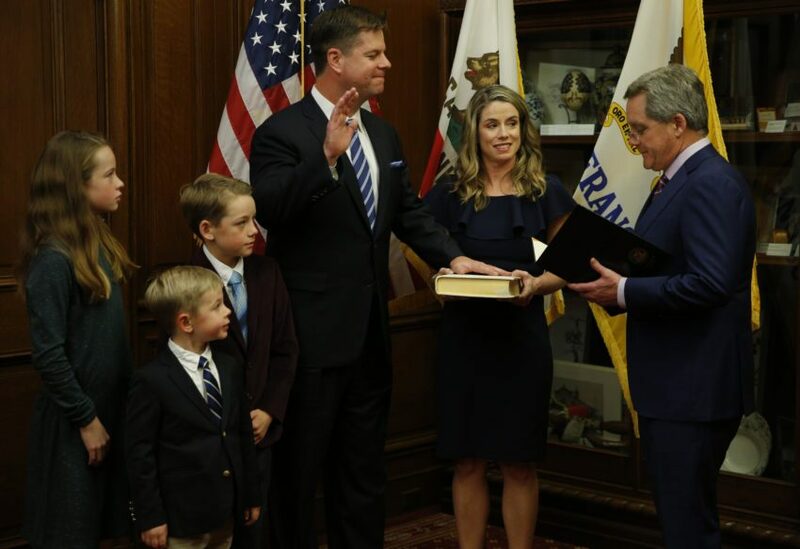 Still reeling from the unexpected death of Mayor Ed Lee, the city of San Francisco woke to another shock today -- District 2 Supervisor Mark Farrell, representing the Marina, was selected successor Mayor by the city’s Board of Supervisors. They voted 6-3 to block acting Mayor and Board President London Breed, Supervisor of the Fillmore, from gaining the advantages of incumbency when she runs for mayor this June. Many of the city’s political observers are scratching their heads at the complexities of identity politics in this vote. Asian and white progressive Supervisors banded together to prevent a historic first: a Black female mayor of San Francisco. Although she was born and raised in the housing projects, London Breed, considered to belong to the moderate wing of the Board of Supervisors, is perceived to be controlled by rich white male tech investors and entrepreneurs. Hillary Ronen, a white female Supervisor who represents the predominantly Latino Mission District, gave a scathing speech denouncing Breed’s backers. Apparently, white and Asian progressives think it is best to have Farrell, a conservative white man and venture capitalist, governing San Francisco for a few months. Farrell was the Supervisor who authored a Board resolution in 2015 calling on former Sheriff Ross Mirkarimi to rescind his order intended to prevent the Sheriff’s staff from cooperating with Immigration Customs & Enforcement (ICE). That the Board progressives would make this man Mayor of San Francisco while ICE is preparing to undermine California's status as a Sanctuary State by raiding businesses in northern California is rather astonishing. The Supervisors’ extraordinary action also undermines the chances of the city’s vanishing Black population winning representation at the highest level of government during the rapid economic and cultural transformation spurred by the tech industry, which is notorious for hiring practices and work environments that are hostile to Blacks, Latinos and women. The politics of respectability, however, is financed by the logic of self-destruction: London Breed is playing ball with the same kind of people whose gentrification policies of “urban renewal” in the 1960s destroyed the same Black neighborhood from which she comes. But what else is she supposed to do? Under white supremacy, all Black people must live in a society whose rules are not designed for our benefit. So whether we choose to play inside the system or outside the system, we can expect to be attacked and controlled. That is why some Black progressives choose to remain silent rather than join those who would attack our community’s best chance to gain the mayor’s office. For Black progressives, the situation illustrates the shortcomings of identity politics in San Francisco. Like the late Mayor Ed Lee, the city’s first Asian mayor, London Breed appears to her colleagues to be too cozy with Ron Conway, the tech investor who manipulates the city’s elections by funding attack ads on candidates that oppose policies of unfettered support for the tech boom. The city’s economic upsurge has not benefited everyone: it has generated a new wave of gentrification that has made the city unaffordable for many middle class people, people of color and artists. Then there’s the issue of police brutality. Breed prides herself on a strong working relationship with the police department. During her re-election bid in 2016, hunger strikers demanded that she call for then police Chief Greg Suhr’s resignation in response to a series of police killings, but she refused comment. This in a city whose Democratic County Central Committee rejected former President Obama’s community policing guidelines and whose Police Commission recently voted to allow the Police Officers Association (POA) to put a measure on the ballot allowing the police to arm themselves with tasers. Breed’s relationship with the POA soured in 2016 after she voted in favor of a day of commemoration for Mario Woods, a 26 year-old African-American man who was shot down by five San Francisco police officers. Should Breed be elected Mayor in June, she will have to offer more than symbolism when the next police killing happens. Black progressives are wondering what meaningful police reforms she will fight for and how vigorously she will fight for them. Breed’s opponents in the upcoming Mayor’s race are former State Senator Mark Leno, a Jewish gay man, and current District 6 Supervisor Jane Kim, a Korean-American woman who represents SoMa, Tenderloin and Treasure Island. Leno appears to have discovered a newfound interest in building mass affordable housing just in time for the Mayor’s race, while Kim co-sponsored (along with late Mayor Ed Lee and then Supervisor Farrell, among others) the tax break that brought the Twitter headquarters to MidMarket. Given the options, many Black people believe London Breed is the only logical choice for our community: she has consistently delivered economic and cultural benefits to the Fillmore and Western Addition, her credibility with the police may give her some influence over their actions, and neither of her opponents can claim to have entirely clean hands. But Black progressives have legitimate reasons to be nervous about whether Breed can be counted on to protect our community’s interests in the face of political demands – and funding – by the tech industry, the real estate industry and the police department. The bottom line is that identity politics do not serve San Francisco’s Black community or the Progressive community. Identity politics will not give us rents we can afford to pay or protect us from overzealous cops; only systemic structural reform of our city’s housing and police systems driven by aggressive public policy will do that. Such policies will come about only by building large ongoing grassroots movements to demand them. Politically speaking, talking with your neighbors about the need for affordable housing and community policing is far more impactful than visiting the voting booth to elect candidates who will do little to provide either. Organizing a movement is how we will get political and economic systems that meet our needs and deserve our support.